Enforcement is being done well, but we also need Education and safety Awareness, especially for our out of town guests visiting Lake Conroe. With the POA's and the Civic Associations we can target problem areas and high crime times to better allocate resources. Work Harder AND Smarter. With DPS, local police, school district police and the game warden working as a team we can create a greater level of awareness and cooperation to identify potential threats and to lessen the potential for crime to occur in Precinct #1. In my current position with the Mont. Co. Sheriff's Office I have coordinated efforts with the schools to create a safer environment. I will re-emphasize working with ICAC (Internet Crimes Against Children) to create greater awareness for parents of what they can be watching for at home. 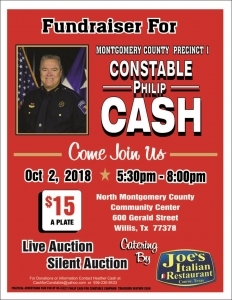 This is one of my top priorities as Constable of Precinct 1. And Im going to dedicate an administrator in the Constable’s Office to work with and be accountable to the School Districts. This is one of the fastest growing areas for concern about public safety. Currently, the Precinct 1 Constable's office has 7 members trained to work with mental health problems. They, as commissioned by Commissioners' Court cover the whole county. I will cross train more staff members in the Constable's Office and triple the number so we will have more people who will be capable of working with mental health concerns. Providing better services with less resources. Sign up to get the latest campaign news and updates.